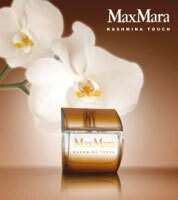 In October Max Mara will launch Kashmina Touch, a follow-up to last year's Silk Touch and Gold Touch fragrances for women. Kashmina Touch, named for Kashmir and Pashmina, is intended to wrap the wearer in elegance and comfort. The floriental fragrance was developed by perfumer Olivier Cresp, and the fragrance notes include lemon, amaretto, daphne, neroli, cedar and musk*. Other recent launches from Max Mara: Max Mara Le Parfum. *The source article is in Bulgarian so take these notes with a grain of salt. I'll update when I can find a better source. Update: the notes, according to Cosmoty.de, are lemon, amaretto accord, winter daphne, neroli, cedar, cashmere wood accord and musk. Doesn't sound like a frag I'd be interested in, but I do wonder what does daphine smell like? Daphne is a really beautifully-scented flower, but don't know how to describe it — it just smells like daphne! But as I said, I wouldn't swear there's even any daphne in this scent. I don't mean to sound horrible, but I remember my mom smelling the original MaxMara in Dillards a few years ago, and telling me it was like the most rank think she had ever smelled. I can't remember what it smelled like, but I want to smell it again, and this flanker too, as the description makes it sound pretty good. How interesting — I'm thinking you must mean the 2004 eponymous one? I don't remember it even having enough character to strike anyone that way — maybe I don't remember it well enough! The cedar piques my interest, but I'm reserving judgement until I get a chance to sniff it. I do like the bottle though. It is very sweet, in a grown-up way. I think one of the major notes is sap. I swapped it, as sweet and I don't get along. I believe Marla did a guest post about it on PST within the past year. Then I think I am remembering the right thing — I thought it was “sugar cane”, but close enough. I wonder if this will smell anything like Cristiano Fissore's “Cashmere” for women. Lemon and cedar…I imagine this will be pretty dry. To my nose, lemon brings a dash of quirkiness to many blends–sassy, sassy! Dept. store brands/companies seem to be striving to create more unusual fragrances this season—perhaps looking for mixes of notes that will smell very distinctive from the competition, while staying within cost boundaries (vs. trying to tailor a scent entirely to trends) ? I'm not a particular fan of CK's “Eternity” but I can't say I wouldn't appreciate fresh scent statements from designers in the spirit of “Eternity”; distinctive blends that couldn't be mistaken for eachother. Although new releases aren't always successful, the fact that they exist implies growing demand for scent amongst a customer base. In most cases, fragrances might be the highest money-maker for a brand, even during uncertain economic times. I msut say I really love the original version of this – it's a lovely warm, sweet ginger-lemon scent, sort of like a more adult Fresh Sugar. The notes for this sounds pretty cozy as well. Could be dry, hard to say w/ the amaretto. I don't really think there is any growing demand for scent — the industry is pretty much flat other than the luxury sector. Personally, I think the massive number of new releases is a more a sign of desperation. IIRC, that original Max Mara got discontinued when MM switched their fragrance license from P&G to Selective Beauty? But not positive. It smells pretty good, something between Molecule 01, L'Antimatiere LesNez and Palisander CdG. And I am not anosmic to it! Hey, that sounds really nice! Hope I'll be able to find it on a counter somewhere.